Will You Still Be Blogging When You're 94? 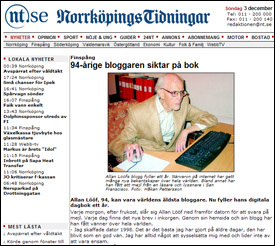 Ninety-four-year-old Allan Loof, of Norrkoping, Sweden, is the world's oldest blogger. What's more, he plans to write a book about his long life. "I'm planning to write my autobiography," he says. "I am surprised myself that I remember so much. My earliest memories are from the age of two. The book would begin in 1914 and continue until today." The world's media reported last week that 92-year-old Donald Crowdis, of Toronto, Canada, was the world's oldest blogger. But they were wrong. They had never heard of Allan Loof. On Dec. 2, Allan's local daily, Norrkopings Tidningar proudly displayed his photo and a story about him by author/photographer Hakan Pettersson on its front page. "If I'm half as productive at 74 as Allan is at 94, I'd be happy," Swedish media practitioner Hans Kullin commented in his media and PR blog Media Culpa. "Two weeks ago, BoingBoing wrote about 92-year-old Donald Crowdis, and asked if he might be the world's oldest blogger. But we who follow the Swedish blogosphere know that Allan Loof is Mr Crowdis' senior by two years. "Allan Loof, 94, has been blogging for a year and has had his own site http://allanloof.com for a couple of years. On his blog he writes that no-one has yet found an older blogger than him: 'Any blogger who is older than me hasn't made contact yet. In a comment it has been said that there might be a 92-year-old Japanese who is currently blogging. Who knows?'" During the decades to follow Allan is frequently letting his voice be heard in different choirs. In 1951 Allan and Lennart Johansson, another Finspang musician, founded a vocal group called Dur och Moll (Major and Minor) also featuring five singing ladies. This vocal group performed very frequently in different shows and cabarets, as well as in entertainment programs. In 1956 they were broadcasted in the legendary Frukostklubben (The Breakfast Club) with the famous Swedish actor Sigge Furst as compere. Allan started to write lyrics earlier, but the first melody (Aurora) was created in 1950. Allan tells that he in the beginning was "humming forth" his tunes, thus "hum music" as his publishing name. It wasn't until he got himself a wire recorder (magenefon) he was able to record and save his ideas for future editing and revisions. When Allan moves from Finspang in 1957 the Dur och Moll septet becomes more difficult to keep together, and we could say that the first musical period in Allan's life ends in 1958. Almost 40 years later Allan learns that one of his old tunes have been performed live in Norrkoping. He then decides to see if he can't make some more melodies again. It worked and the three recording we see presented on these pages are composed recently. Indeed a very strong comeback! Allan is very careful to mention about the background and the reason why he wanted to compose these new melodies: "There was a lot written in the newspapers about how miserable the situation was for the old people living in the homes for the aged and similar institutions." Since I have had the privilege of being healthy, I want to spread some joy among those older being less privileged. The melodies tells much about romantic experiences we have had during life, and remembering these beautiful memories can give us some strength during our older days. Who said bloggers are always young? Perhaps blogging keeps us young in heart. 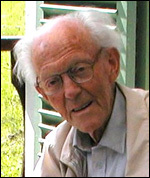 Long live Allan Loof -- and a happy birthday to Donald Crowdis of Toronto, almost certainly the world's second-oldest blogger, who will be 93 on Christmas Eve. Eric Shackle is an 87-year-old citizen reporter.